ERA miGuard wireless burglar alarm system, with telephone call, SMS text or SmartPhone app alert when alarm is triggered. Control via Apple or Android SmartPhone app. Advanced touch screen control panel with LCD. Requires standard sized SIM card* for alerts. Solar powered 110db external siren box. Adjustable siren volume and duration. Set up personalised SMS text notifications. Store 5 phone numbers and 5 SMS numbers. Mic and speaker allow you to hear and talk back. Batteries for all components are included. Connect up to 50 sensors, 50 RFID Tags and 10 remotes. The ERA Wireless Alarm series are a range of smart home security alarms designed to give you ultimate control of your home security. The intuitive wireless system has been designed with DIY in mind ensuring no wiring or running cables in walls or under the carpet and you won't need the services of a qualified electrician. The alarm components are easy to install on a DIY basis and have a wide 80 metre wireless range (in open field conditions) using a 433MHz frequency, ensuring you can place them practically anywhere. 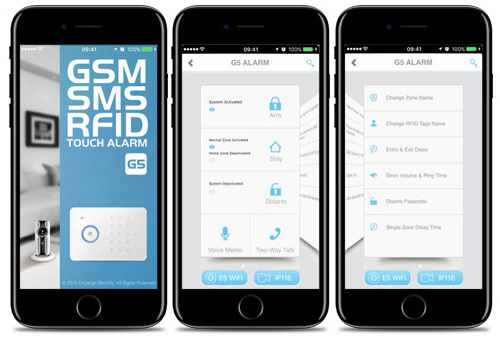 The ERA miGuard G5 Telecommunicating Smart Alarm is a wireless GSM alarm with integrated mobile phone technology and is operated by a touch screen control panel, which incorporates a SIM Card holder and allows communication directly with the control panel. In addition, the alarm system can be operated via a Smartphone App, one of the included remote controls and can be disarmed by one of the RFID Contactless Tags. When the alarm is triggered, a loud 95db siren will sound from the control panel to alert others of an intruder and the system will also alert you via a phone call, text message smartphone app alert. This alarm kit also includes a wireless solar powered external siren box which produces an 110db siren when the alarm is triggered. The pet friendly sensor activates when larger movement is detected making it ideal for homes with one small pet (less than 20 - 25kg). The detector should be placed in the corner of rooms that are vulnerable to intruders. When the alarm is armed an infrared sensor will detect any larger movement and activate the loud alarm siren. When the alarm is armed, if a door or window that is protected by the contact is opened the contact is broken activating the loud external siren. The keyfob is used to arm or disarm the alarm system without the need for a PIN code and can be used from any room in your home. The keyfob also includes a panic button should you need to sound the alarm in an emergency. The wireless radio-frequency identification (RFID) Tags will disarm the alarm, without needing a code, by swiping across the control panel. These lightweight tags are also designed to be fitted to your key ring. The keypad is used to arm or disarm the alarm system via entry of your own unique PIN code. The keypad also integrates a SIM card holder allowing you to listen in and two-way talk via your phone. The solar powered siren box includes a rechargeable battery and does not require a mains power supply. Fitted in a highly visible location on the exterior of the property the loud 110dB siren will sound and the LED will flash when the alarm is triggered. The alarm system includes a built-in SIM card holder and can store up to five individual telephone numbers and will ring them in an order you choose if the alarm triggered. You can also store five SMS numbers in order to receive text message alerts. The alarm can be set to create two different zones allowing you to arm one or both zones. This can be especially useful if you decide to split the upstairs and downstairs of a property into two zones. While away from the property you would activate both zones and during the night you could activate only the downstairs zone. The alarm siren box includes a rechargeable battery which is charged by a solar panel. There alarm siren box is completely wireless meaning there are no wires or cables and you will not need to climb a ladder to change the battery. The standby time for the alarm is 45 days to ensure the alarm stays powered even when there is no sunlight at all. * Requirements: This alarm system requires a standard sized SIM Card (Excludes Three network). SmartPhone must be iOS 7.0 and above or Android 2.2 and above.